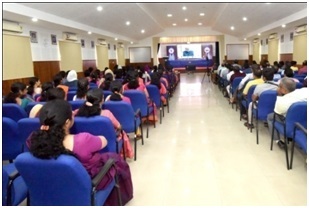 As part of International Women’s Day Celebrations, a live webcast of the Hon’ble Prime Minister, Shri Narendra Modi’s address to the nation was arranged at the Institute on 8 March, 2019. The staff of ICAR-CIFT actively participated and witnessed the success stories of women Self Help Groups (SHGs). 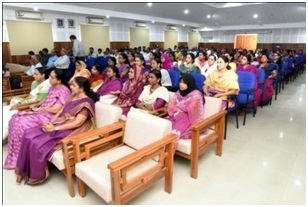 Almost, 187 staff members attended the programme. The programme was co-ordinated by Dr. Pe. Jeyya Jeyanthi, Liaison Officer, Institute Women’s Cell, ICAR-CIFT, Cochin. To emphasis on the gender parity, the theme of this year International Women’s Day (IWD) is selected by the United Nation as ‘Think equal, Build smart and Innovate for Change’ with the campaign theme of ‘#Balance for Better’. 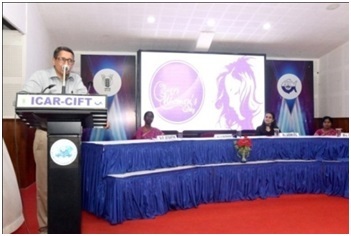 Presiding over the formal Dr. Ravishankar C.N., Director emphasized on the gender parity, and mentioned that ‘Every day is a Women’s Day’ as they are representing, participating and empowering in their professional and personal life. Welcoming the gathering, Dr. Jeyanthi highlighted that there is existence of disproportional representation at the top level positions world-wide, as fewer representation by women at the decision making levels. Smt. Lakshmi Atul, Vice-president of Aries Group of Companies and Mrs. India Face of South - Queen of Substance and Mrs. India – Intelligent (2017), Mrs. United Nation Grand Prix (2018), Vice President of the prestigious Indy Wood Film Carnival, Head of the Oscar Awards Consultancy and the Film Festival Promotion Divisions was the Chief Guest of the day. She has been part of the documentary ‘Dams – The lethal water bombs’ and ‘Dam 999’, an international movie which was shortlisted for the Oscar Awards and is also a TV anchor, proactive in raising public voice and funds for the social causes and also regular at Half Marathons aimed at raising awareness regarding various social issues. She emphasized on various issues which a woman should take care of in their respective field of interest viz., determination, time management, passion and self confidence. She shared her personal experience towards balancing professional and personal life. She also emphasized that sparing self-time for oneself is necessary for individual motivation and development. Smt. P.R. Mini, Member, Institute Women Cell proposed the vote of thanks. A video showing ‘Indian First Women Achievers during recent past’ was also screened. 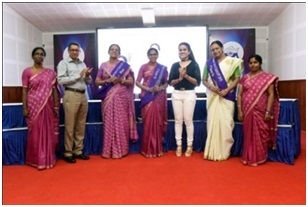 The ‘Women Icon of ICAR-CIFT-2019’ (both winner and runners) selected through opinion poll were honored during the function. The function came to an end with the graceful classical dance performance of women staff of ICAR-CIFT, depicting the ‘Kerala Flood’ situation towards paying tribute to the tireless effort by fishermen during the flood rescue and rehabilitation. The programme was concluded with national anthem.